French think tank négaWatt published a study back in 2011 investigating how the country could switch almost completely to renewable energy. Now, the analysis and an overview of charts has been made available in English. Craig Morris investigates. A few months ago, I reviewed French energy agency Ademe’s suppressed investigation of a transition to renewables. In that article, I also mention négaWatt’s previous study as the only one looking into a nearly 100 percent supply of renewable energy for the country. Now, a short version of the study has been made available in English. Caption: Like the Germans, French experts do not believe that a transition to renewables is possible without drastically lowering energy demand. Here, we see that “sufficiency” – a change in behavior – will be needed along with efficiency and renewables. Source: négaWatt. The authors have a hierarchy of steps to take. 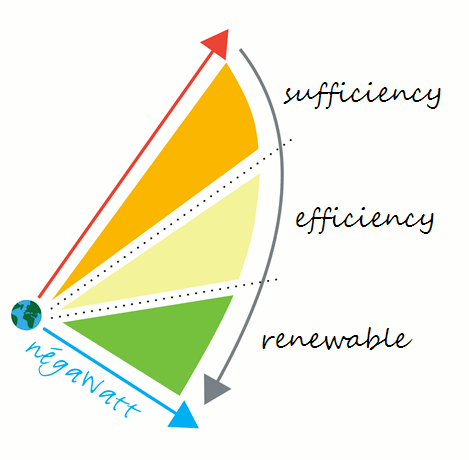 First, “sufficiency” and efficiency reduces energy demand. Second, renewable energy covers 94% of the remaining demand. Third, there is no need for nuclear or CCS at that point. “Sufficiency” deserves a fuller explanation. 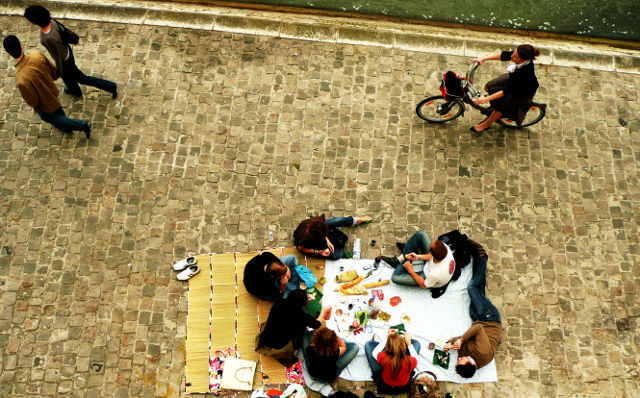 For mobility, we are talking partly about urban planning. The share of cars in trips would fall from 63 to 42 percent, for instance, as people transition to multimodal mobility. In other words, you will use your smartphone to find the best way of taking your next trip, which could be a combination of railway, rental bikes, walking, and taxis or car-sharing. And of course, cars themselves will be electric within cities and hybrids fueled with biogas for longer trips. The authors also have air travel cut practically in half by 2050 (there is no clear renewable solution for airplanes). Nonetheless, the study stresses that “sufficiency does not mean at all less pleasure.” Unfortunately, no further explanation is given. (Since this issue is so crucial, I refer readers to Bill McKibben’s Deep Economy, where he convincingly explains that western countries like France, the US, and Germany have reached the point where greater material wealth does not make us more happy – stronger communities do). The négaWatt study points out that farming, for instance, would be “more eco-friendly,” and McKibben would add that farmers markets are a great place for community-building. The spread of renewables is interesting partly for the dominance of bioenergy in all of its forms: solid, liquid, and gaseous. While the reliance on biomass may raise some eyebrows, the authors stress that meat consumption would be cut in half, thereby freeing up a lot of agricultural space. In the chart above, solid biomass alone makes up the biggest share of total renewable energy supply. 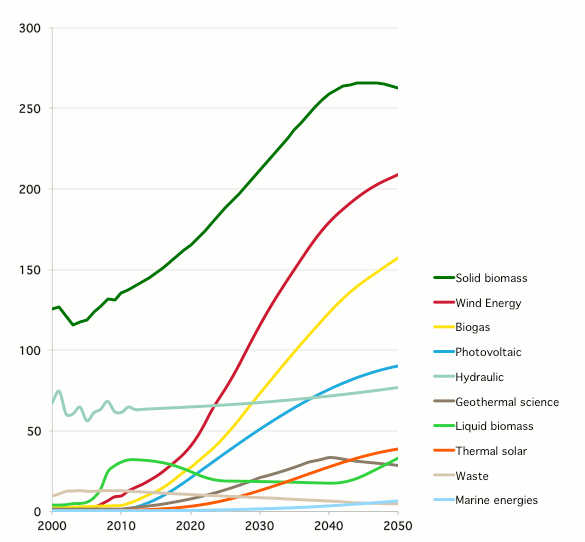 Wind is the second biggest after solid biomass, with solar coming in fourth behind biogas. Sufficiency also includes recycling, so authors predict that the share of reused aluminum would more than double from 37 percent in 2010 to 86 percent in 2050. The share of reused glass would rise even more impressively from 35 to 90 percent. Likewise, only 52 percent of steel was recycled in 2010, and that amount will also nearly double to 90 percent by 2050. In the end, some coal would still be used in industrial processes and as coke in the steel industry, with oil mainly still being used for transportation. The paper also maps out how France could phase out nuclear by 2033 – and argues that it needs to. I refer you to the study itself for more details. The authors speak of a “no-regret path” that will “undoubtedly become profitable for society in the short or longer term.” Why not have a look at the full analysis yourself and drop us a comment below to tell us what you think? These prognostications and speculations are always interesting but ultimately not really very illuminating, especially in a country like France so wedded to nuclear. If the price of PV and storage continues to fall dramatically then really all other technologies become pretty irrelevant. It will simply come to dominate the market through the price effect alone. Let’s see…. Cutting French energy usage by 60%, cutting meat consumption by half, cutting dairy production, building wind and solar capacity capable of producing over 300 TWh of electricity annually (Germany currently generates about 90 TWh with wind and solar), biomass and biogas generation 8 times greater than Germany currently, gas from electricity system for balancing system fluctuation, air travel cut by half…. Well, I guess this is all feasible. But if you discard the anti-nuclear stance, the plan is absurd. France could become self-sufficient in energy quicker and cheaper by keeping nuclear and adding renewable energy. France produces around 90% of its electricity without carbon emissions. And has done it for 15 years already. The target of German Energiewende is 80% by 2050. Climatewise, which country do you think has made a better choice?